We don’t see this beautiful little flower very often because it is usually hidden in the daytime and opens during the hours of darkness to release it’s beautiful perfume. 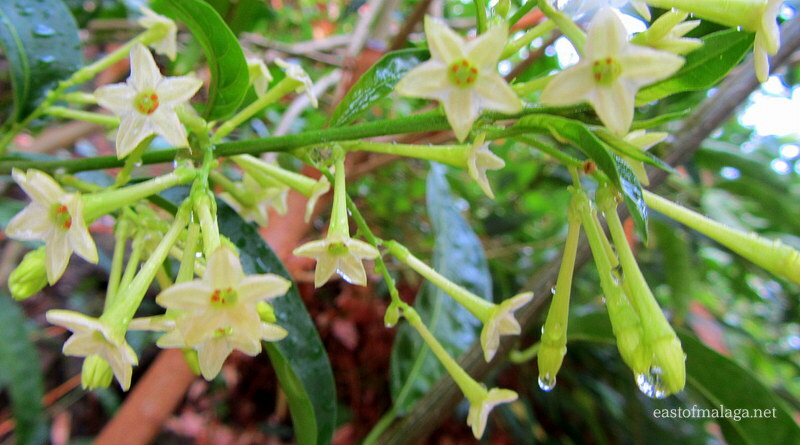 I’ve written about the Dama de Noche (or night-scented jasmine) before, but it made an appearance today because we had heavy rain for most of the morning, and have had a dismal, cloudy afternoon. The poor plant must think the evening is upon us already! Anyway, it gave me the opportunity to photograph raindrops on the flowers from An Unusual POV, which just happens to be this week’s WordPress Photo Challenge! Have YOU had a Silver Lining, recently? This entry was tagged Andalucía, Cómpeta, East of Malaga, Europe, flowers, garden, gardening, gardens, Malaga, nature, photography, Spain, Travel theme, weather, Weekly Photo challenge. Bookmark the permalink. Languorous yet full of afterglow. Dama de noche is a very interesting lovely. Do you know what I admire about this photograph? It is the way you have been able to capture those water drops and the reflections visible on them Almost as if there resides a complete world inside each of the drops.Do fairylands exist here? Thank you so much Shakti – what a lovely comment and so very kind of you to say so. You’ve made my day! Ah yes, the flowers are very similar to “tobacco plants” – I know what you mean! What a lovely shot Marianne! Hadn’t realised they could be ‘fooled’ into opening 🙂 Reminds me of birds getting agitated during a solar eclipse! Thanks Madhu – much appreciated. such a lovely flower, but the rain is perfect, dripping and sparkling .. enough to brighten a dull afternoon, well caught! Lovely little blooms – how fortunate that the weather conditions made them pop out to see what was happening! Pretty, Marianne. The raindrops give it a sparkly effect. Very pretty. You makes the most of the Dama’s grotty little flowers whose wicked perfume makes you swoon. The water in your photo brings the blossom to life. I can just hear our little rill gurgling in the distance which means my lettuce and tomatoes will survive another week! They have a look of teeny-tiny narcissus blooms, don’t they? That is a beautiful capture, Marianne! The rain drops made the flowers even more pretty. Pingback: Weekly Photo Challenge / B4 Retouch: An Unusual POV (Tibet Shigatse) | What's (in) the picture? We have a few clumps of plants dotted around the house because the perfume is so lovely. Fabulous, I’m glad it came out early for you! ….me too, and Mr Sunshine has just burst through the clouds! Yaay! There is so much to love about where you live. I`m glad to at least get to read about it here. Beautiful. Rain can make for wonderful photos and just sometimes must come as a relief to you if not to us, rain sogged, Londoners.